"Henry was born at Richmond, Jefferson Co., O., June 4, 1859, son William Henry and Deborah Ann (Hargrave) Crew. His father (1828-1870) was a merchant. His grandfather, Henry Crew, who married Margaret Bailey, removed from Virginia to Richmond, O., in 1816, opened a store for general merchandise, accumulated considerable wealth, did a commission business with Baltimore and Philadelphia, and was a leading Quaker. The grandson and namesake received his preparatory at Wilmington, O., was graduated (A.B.) Princeton in 1884, and at Johns Hopkins (Ph.D.) in 1887, and pursued a course of study at Berlin University. He began the teaching of physics assistant at Johns Hopkins University in 1887, during 1888-91 was instructor in physics at Haverford College. 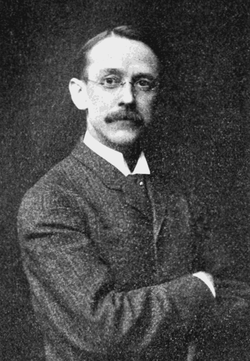 In 1891-92 he was astronomer at Lick Observatory, and from 1892 until the time he has been professor of physics at Northwestern University. Among Prof. Crew's notable achievements in science is the discovery the effect of change in the gaseous medium surrounding an arc upon the lines of the spectrum of that arc (Phil. Mag., 1900). He was engineer for the American Luxfer Prism Co. (1898-99) and has been assistant editor of "Astrophysical Journal" since 1892. In 1900 he served as delegate to the congress of physicists Paris. He is a member of National Academy of Science, American Academy of Arts and Sciences, American Physical Society (president 1909), Illinois Academy of Science (president 1912), and the American Association for the Advancement of Science (vice president 1914). His clubs are: University of Chicago and University of Evanston. Prof. Crew was married, July 17, 1890 to Helen C., daughter of Thomas E. Coale, of Baltimore; their children are: Alice Hargrave, Mildred, and William Henry Crew."